This giveaway is closed. Thank you all sooo much for entering and supporting our giveaway! I love you all. Stay tuned to my blog... More giveaways will be coming soon! Today I've teamed up with 16 fellow beauty bloggers to bring you a fast and furiously fun Fall Blog Hop GIVEAWAY! If you are unfamiliar with just what a blog hop is, it's simple. Each lady in the hop is giving away a beauty related prize in her own blog giveaway and all you have to do is enter my giveaway first (in the Rafflecopter widget, below) then, once you've finished entering my giveaway, you click the link provided for your ease and convenience to the next blog. Enter that giveaway and so on around until you complete the loop, landing right back here where you started, on my blog. That's all there is to it! Easy-Peasy! And because the loop is only seventeen blogs long, entering all of the giveaways will not take too long. Besides the chance to win 17 different new beauty prizes, after the Blog Hop Giveaway has ended and we've drawn the winners, ONE very lucky person from the pool of 17 winners will receive the GRAND PRIZE of a $300 gift card to their choice of Sephora or Ulta Beauty. 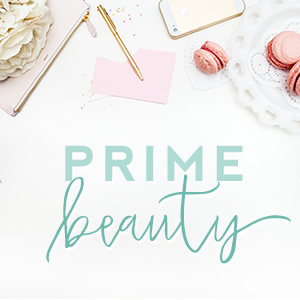 Just think, three hundred clams to blow on some of those oh-so-coveted limited edition holiday beauty goodies. Yassss! 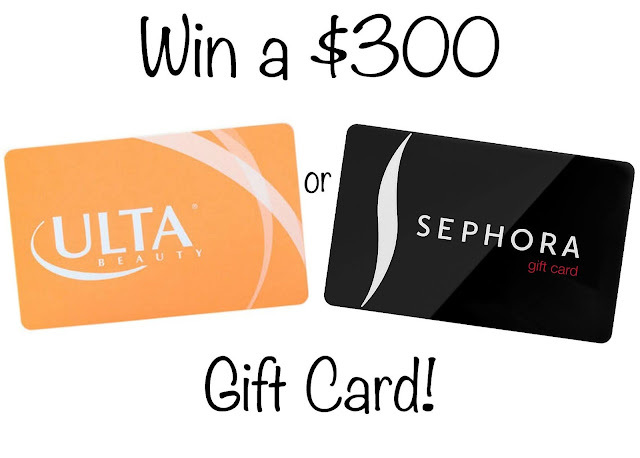 Remember: If you want to up your chance of winning that sweet, sweet shopping spree at either Sephora or Ulta Beauty, you must follow the rules carefully; be sure to jump to every blog in the the loop and enter all of the giveaways. Make sure that you follow all of the rules of every individual giveaway to avoid being disqualified. This giveaway loop will run for 2 weeks, ending on September 14th at 11:59 PM EST. This giveaway is open to residents of the United States and Canada. Are you ready to start hopping? 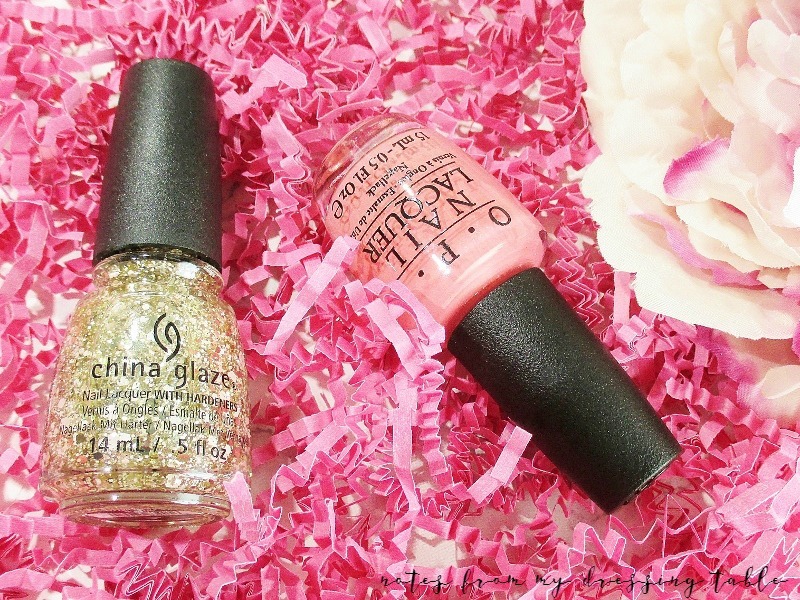 Well, first things first -- You've gotta enter my giveaway! The rules are simple: The giveaway runs in the time, stated above and is open to residents of the US and Canada. You must be 18 or older or have a parent's or legal guardian's permission to enter and give me your contact information. This is a one and done, if the prize is lost or damaged in the mail, no replacement will be made. No cash substitution is offered or implied. Any taxes, customs fees are the sole responsibility of the winner. This giveaway is void where prohibited by law. I will draw a winner at random at the close of the giveaway and contact the winner by e-mail. The winner will have 48 hours to respond. If I don't hear from the winner by that time, a new winner will be drawn and contacted. Enter by completing as many opportunities as you please, in the Rafflecopter widget below, after completing the mandatory entries. Please do not e-mail or put your entries in comments, as those entries will be voided. So, what am I giving away? Gorgeous skin care to nourish and protect your complexion now, and into the Fall. 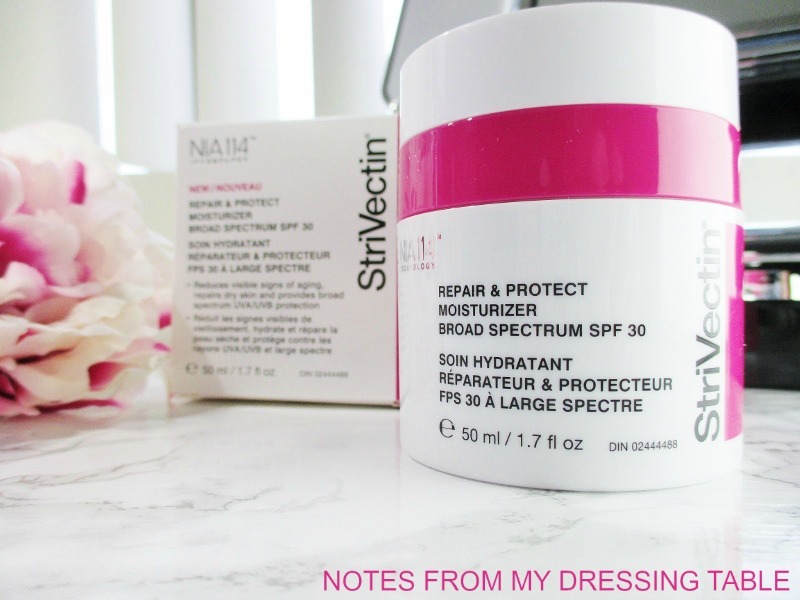 The winner of my giveaway will receive a brand new, full sized jar of StriVectin Repair & Protect Moisturizer Broad Spectrum SPF 30. This is a prize with a retail value of $89.00! Welcome to another edition of Fashion Flash! 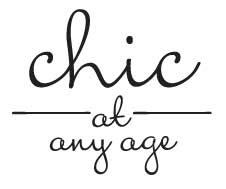 This week is being hosted by the oh-so-fashionable Josephine at Chic at Any Age. 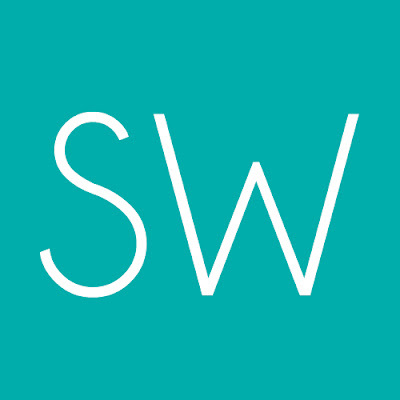 Please pop over to enjoy a range of articles written by some of the best bloggers over forty. 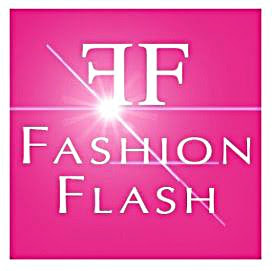 I hope that you enjoy this week's Fashion Flash and that you will join us again, next week! It is rare that I encounter an all skin types moisturizer that can stand up to my very dry skin and actually make it feel lovely and hydrated. Surprisingly, Clinique Moisture Surge Extended Thirst Relief Gel-Creme is one of those rare moisturizers. 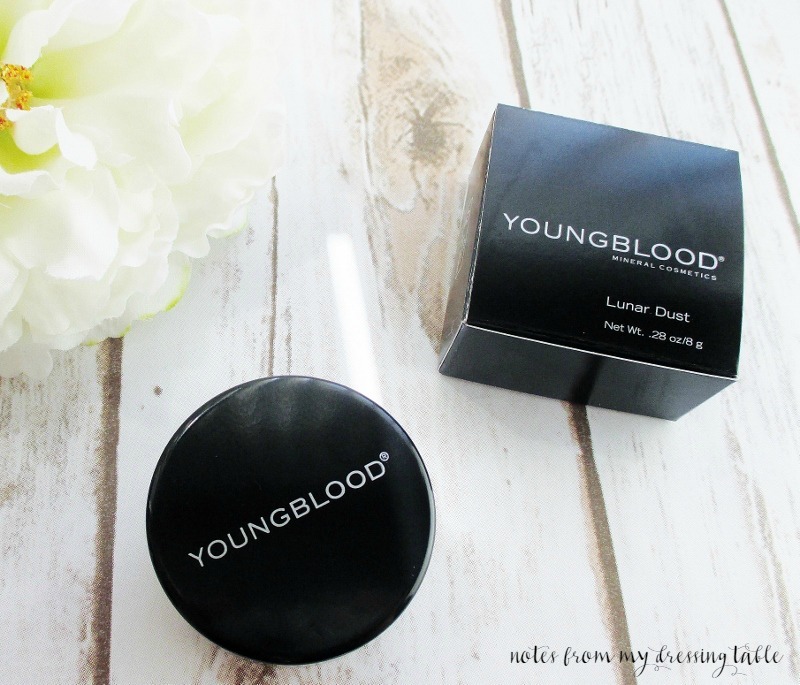 A lightweight, unscented gel-creme that feels cooling, luxurious and silky; it spreads readily across my skin and drops in to provide hours and hours of hydration, plumps my skin and leaves it feeling velvety soft, smooth and comfortable. This moisturizer is free of chemical sunscreens. Each sip sized sachet packet is enough for one application, for me hairline to bustline. My preferred use is for day, under makeup and it's especially nice after I've exfoliated or done a little peel as it is soothing and very gentle. Clinique Moisture Surge Extended Thirst Relief Gel-Creme is a lovely product and I now have a big jar of it on my Sephora Loves List to pick up in the near future. 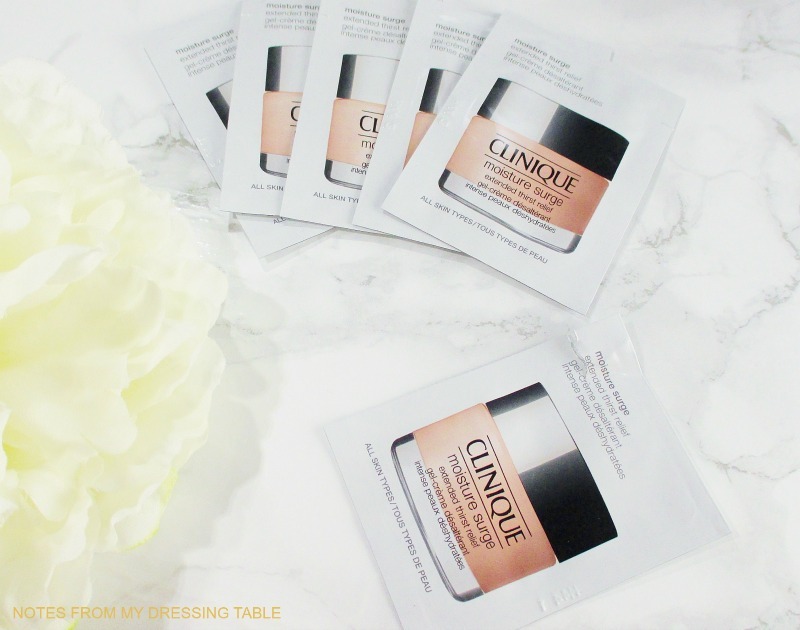 Are you a fan of Clinique skin care? Have you tried the Moisture Surge Extended Thirst Relief Gel-Creme? If you're interested you can pick it up at Sephora, Nordstrom, Macy's, Lord & Taylor and other fine retailers that carry Clinique. Don't forget to use E-Bates and get paid to shop! Not yet a member? Just click the link to join for free and start getting cash back on online purchases. Every revolutionary step we take has been paved by trailblazing women before us. Madam C.J. Walker was a woman who lived with a vision that was beyond her time. America’s first female self-made millionaire, Madam Walker defied history and expectations and built a global beauty empire that empowered women to be their best – while enriching communities across the nation through her generous philanthropy and activism. 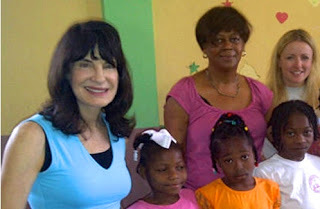 Whether you are building a business, getting an education, raising a family, ascending the corporate ranks, serving country and community through public office, the military, non-profits or volunteerism, or any combination of these and more – you are a Modern Day Madam…a woman defying the odds every day to create the life you desire. Inspired by the original Madam Walker, Madam C J Walker Beauty Culture is more than a brand, it is a legacy. Reimagined for modern beauties and our specific hair needs, these are performance driven products formulated with natural, high quality ingredients that deliver results and help us all to be unapologetic in the expression of our individual beauty. I received two items from this line to try. I was encouraged to peruse the Madam C J Walker Collection on Sephora's website and choose a couple of products that would best suit my own tresses. I went right to the Brassica Seed and Shea Oils Smooth Style line. I have long, rather thicker than normal, wurly, frizz prone hair that is dry and damaged, thanks to my affinity for being blonde and playing with creative colours. My hair needs deep hydration, tons of slip and to be coated, cushioned and protected from friction, heat and just day to day living. Madam C J Walker delivers. Madam C J Walker Brassica Seed & Shea Oils Silkening Leave In is formulated with Brassica Seed Oil, a natural alternative to silicone that provides the slip, smoothness and luster I desire without creating buildup or weighing my hair down. This rich, balmy stuff smells absolutely delicious with notes of Spun Sugar, Red Velvet Creme and I detect Musk, as well. The scent is prevalent without being overwhelming and it lingers softly, beautifully in my hair for days. Oh, and it leaves my hands smelling nice for hours, even after multiple hand washings. I like to apply Silkening Leave In after I wash my hair. I put my freshly washed and conditioned hair loosely in my turbie for a couple of minutes then let it down, divide it in half down the back and apply about a nickle size dollop, first to one side then the other, concentrating on my length and ends then finishing up at my roots and crown. I get a little extra to work into particularly dry/frizz prone areas of my canopy then I detangle, working gently from my ends upward, using my wide tooth comb. The Brassica Seed and Shea Oils provide the slip I need to nearly effortlessly work the snarls from my tangle prone wurls and deeply hydrates and softens my distressed tresses. If I'm air drying, I add a little hair oil to seal in all of that good moisture and further soften and condition. I then damp bun or let it hang loose to dry. 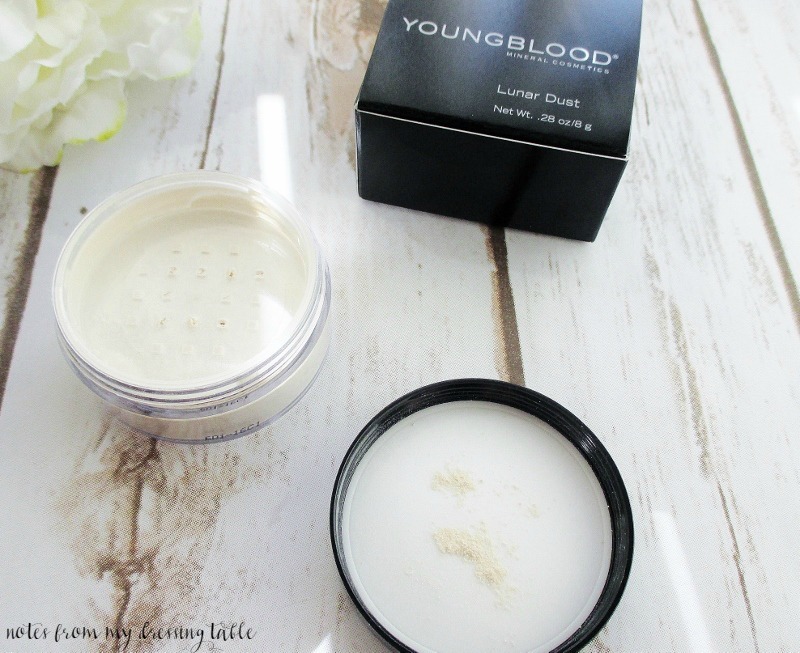 From my first use of this gorgeous product, it became a favorite. -Brassica Seed Oil: A natural alternative to silicone. -Shea Oil: A natural deep conditioner for hair. Water, Glycerin (Vegetable), Glyceryl Stearate, Cetyl Alcohol, Capric/Caprylic Triglycerides (Coconut Oil), Behentrimonium Chloride, Polyquaternium-7, Glyceryl Caprylate, Butyrospermum Parkii (Shea) Butter*+, Brassica Oleracea Italica (Broccoli) Seed Oil, Hydrolyzed Vegetable Protein PG-Propyl Silanetriol, Cocos Nucifera (Coconut) Oil, Bambusa Vulgaris Extract, Salvia Officinalis (Sage) Leaf Extract, Symphylum Officinate Leaf Extract, Equisetum Arvense Extract, Cetearyl Alcohol, Dimethicone, Glyceryl Undecylenate, Coco-Glucoside, Hydrolyzed Keratin, Algin, Chitosan, Gellan Gum, Fragrance (Essential Oil Blend). Blow drying or as I like to call it, "blow frying" is a step I have to take if I want the sleek, smooth look I prefer for my hair. Being absolutely hopeless with a blow dryer and round brush, I rely on my Revlon One Step Hair Dryer and Styler and of course, Madam C J Walker Brassica Seed & Shea Oil Silkening Blow Out Creme. The Silkening Blow Out Creme is, in reality a thin, quite liquid-y formulation that contains Brassica Seed Oil and Shea that provides natural heat protection and brush glide to reduce tug, friction and breakage. 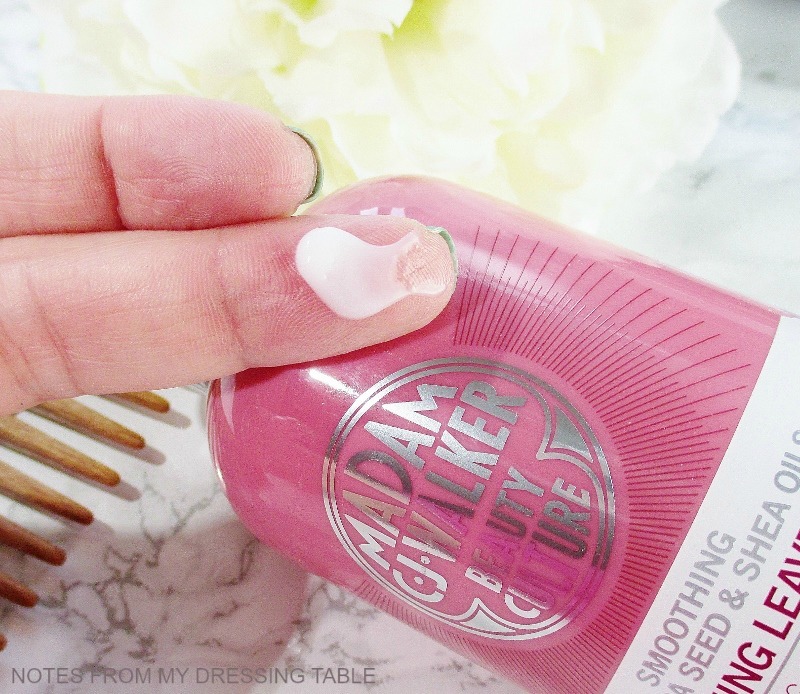 This blow out creme has the same delicious, delightful scent as it's sister product. 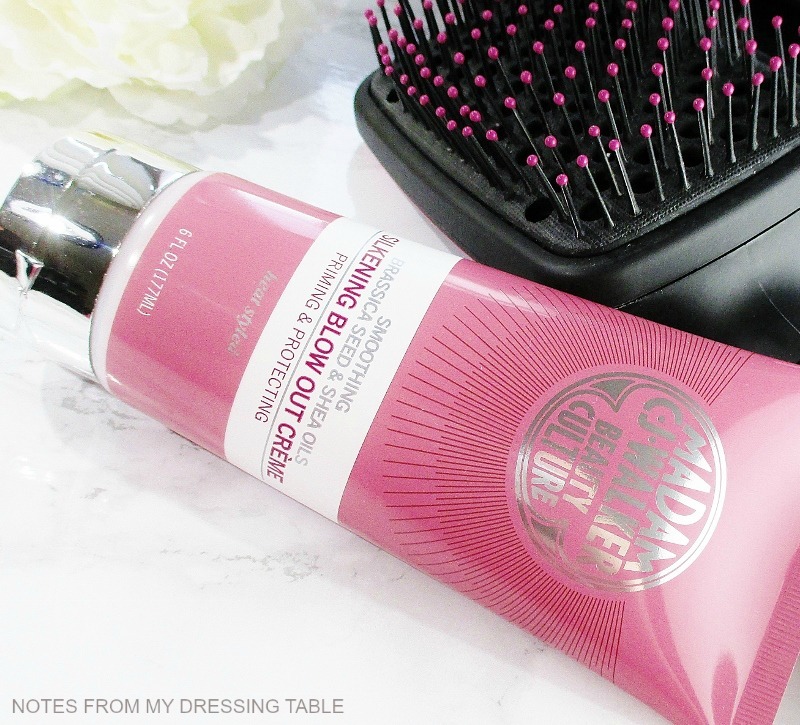 When I use this product before I blow dry, my hair comes out so soft, silky-smooth, shiny and it stays that way for days and days, even when I wear it up then let it down, again. If you follow me on Snapchat, you will have seen my hair in it's sleek, shining freshly blown out glory. I am so impressed with this incredible stuff! Water, Glyceryl Stearate, Cyclopentasiloxane, Glycerin (Vegetable), Diheptyl Succinate, Butyrospermum Parkii (Shea) Butter*+, Cetyl Alcohol, Behentrimonium Chloride, Glyceryl Caprylate, Brassica Oleracea Italica (Broccoli) Seed Oil, Cocos Nucifera (Coconut) Oil, Panthenol, Salvia Officinalis (Sage) Leaf Extract, Bambusa Vulgaris Extract, Symphytum Officinale Leaf Extract, Equisetum Arvense Extract, Capryloyl Glycerin/Sebacic Acid Copolymer, Glyceryl Undecylenate, PVP, Polyquaternium-7, Caprylic/Capric Triglyceride (Coconut Oil), Coco-Glucoside, Hydrolyzed Keratin, Algin, Chitosan, Gellan Gum, Fragrance (Essential Oil Blend). I am not, however impressed with the packaging. The tube in which my Silkening Blow Out Creme arrived has a large opening and merely tipping it down to dispense the product results in a gusher with splashing and blow out creme running down my shirt. *sigh* I have to be very careful about how I dispense this product for use. If you ask me, this gorgeous stuff needs to be in a pump bottle or, just switch the packaging of these two products. Put the blow out creme in the disc top cap bottle and the thick leave in in the tube. Packaging aside, I am deeply impressed with Madam C J Walker Beauty Culture products and their mission statement. The Brassica Seed & Shea Oils Silkening Leave In and Brassica Seed & Shea Oils Silkening Blow Out Creme are beautiful products that deliver the results that they promise. Both products are free of Sulfates, Parabens and Phthalates and this line is Cruelty Free. Madam C J Walker Beauty Culture has a full range of products designed to address the concerns and unique needs of every hair type. Have you tried this brand? What are your favorites? Please do tell. Foundation. It is a makeup item that is for me, fraught with angst. For that reason, I have very few foundations in my life and I tend to remain extremely faithful to them. But like anyone, I like a new foundation, now and again and it's fun to try samples of the latest and greatest, on the off chance that I will encounter a winner. Makeup Forever Ultra HD Invisible Cover Foundation and Makeup Forever Ultra HD Concealer. I had been eyeing the foundation on the Sephora website and arguing with myself about whether or not I should order it. Most of the reviews I have read and seen on YouTube were quite positive, some call it Holy Grail. However, most of the people doing those reviews are substantially younger than I and do not share my particular skin concerns. As there is no Sephora store in my immediate area, I can't just run out to get samples and let's face it, $43.00 is a bit much to risk on a flyer. I know that I can return but wrapping and packing it back up, sending it back, waiting for my refund... Raggle Baggle I don't need or want. So, I was happy to receive these samples in a recent Sephora order. Finally! I can see what all of the hoopla is about! Developed specifically for the film and TV industry's most advanced technology, Ultra HD Liquid Foundation creates a naturally flawless complexion—in and out of the spotlight. Invisible under the latest, super-focused 4k lens, this revolutionary foundation features uniquely-coated pigments that provide medium to buildable coverage with an even lighter weight, second-skin texture that looks just like skin. This formula leaves your complexion with the same flawless results that you’d achieve with a flat foundation brush in a tap and stretch motion. It contains hyaluronic spheres to ensure comfortable wear on all normal, dry and combination skin types, and it lasts all day, leaving a natural-looking finish. Now available in an expanded range of 40 shades to match all skintones, Ultra HD is the perfect everyday foundation for a flawless complexion—and it doesn’t require touch ups. 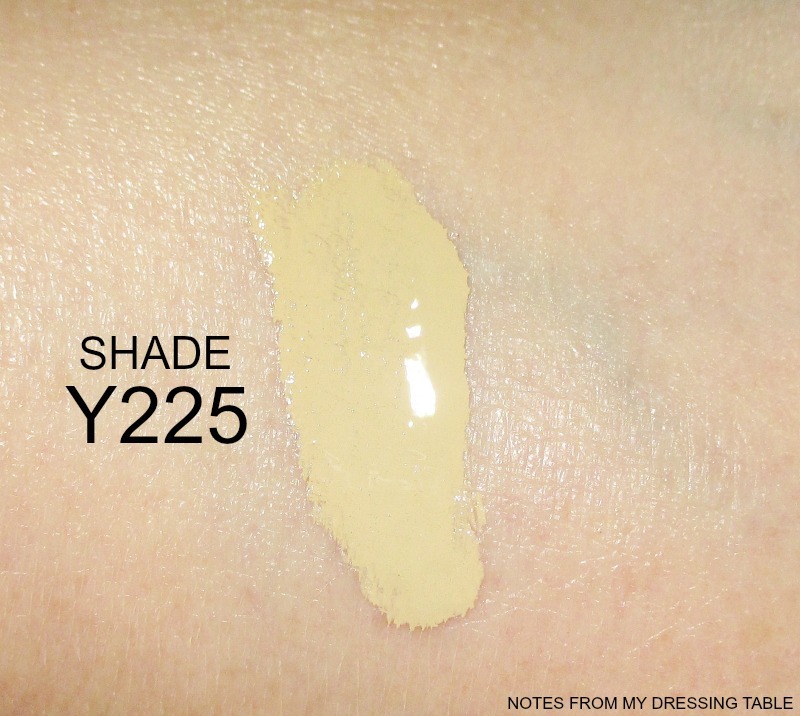 Shade: Too dark and far too yellow for my fair, neutral skin tone. No worries, in this case as I was testing formula, not shade. I figured that if this stuff did blow my doors off, I could get matched, next time I'm in the Valley and can pop into a Sephora. How Does It Apply? Smooth, easy. 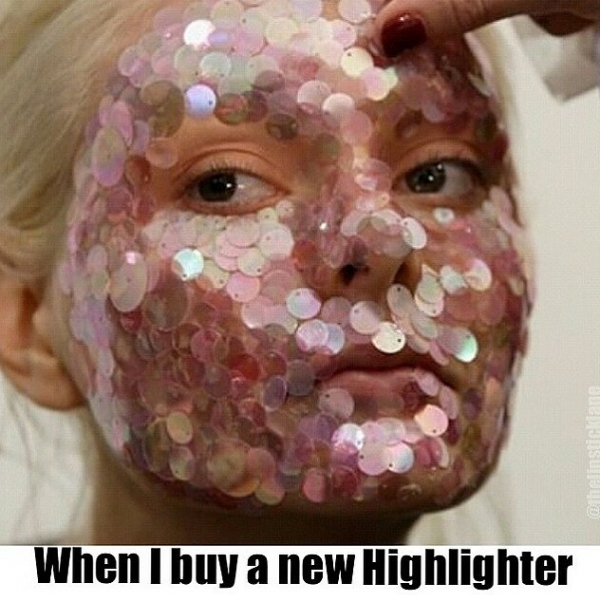 I applied it once, with a brush, once with a damp Beauty Blender. The brush gave me fuller coverage, the Beauty Blender more sheer. Finish? Very smooth, supplying a perfected, blank canvas. I actually kind of loved that aspect. My skin, at least for a little while looked as near absolutely flawless as it could be. How Does It Feel? In a word, heavy. This makeup feels like a mask on my skin. It is suffocating and after a few hours, I was ready to claw it off my face. How Does It Look? On me? Immediately upon application, lovely but that didn't last for long. How Does It Wear? This is where this foundation really came off the rails for me. Wear is abysmal. 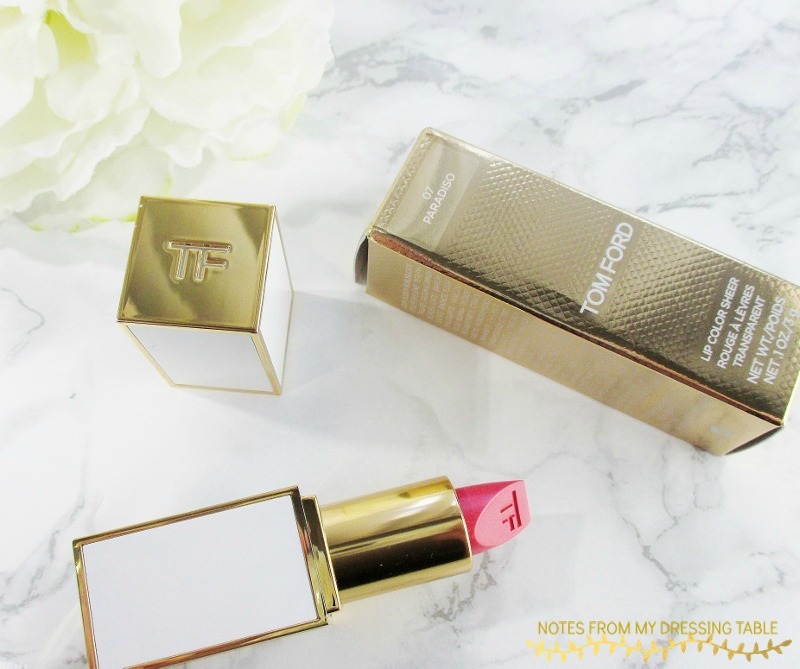 This foundation soon started settling into every fine line, wrinkle, fold on my face. I was able to gently smooth it back out and setting it with powder helped it "hold the line" for a little while but by my next mirror check, about an hour later, my face looked like fifty miles of bad road. Every little line, deeper line, the tiny cracks around my mouth and chin. My forehead. Oh. Lord. No! Aside from the setting and cracking, this foundation did hang together beautifully without fading, clotting or transferring. It even held up to my allergy stricken beak being blown a million times. That's impressive! Guilty of being utterly incompatible with my skin type, texture and tone. The concealer, while a lovely match for me, did a halfway decent job on my dark circles, for a little while then just devolved into a mass of lines and faded to allow my darkness to take control, once again. So it's a no, as well. Please understand, I am not trashing these products. I am just saying that they are not appropriate for my own skin. 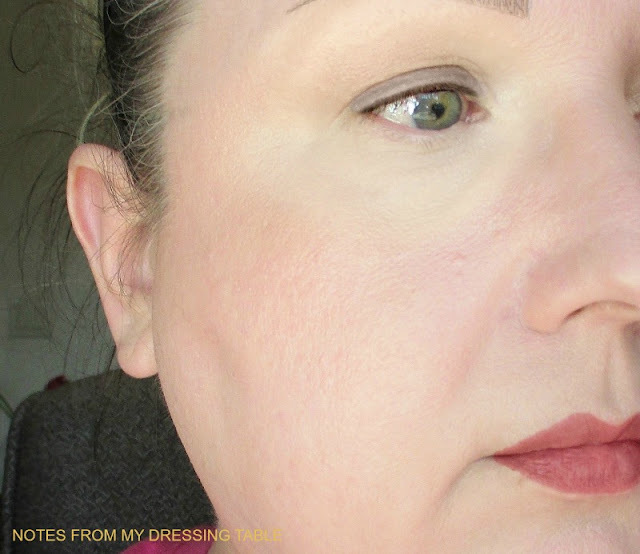 I have seen this foundation and concealer work beautifully for other people, mostly those much younger than I. I believe that this makeup was designed with young, firm, line free, oil prone skin in mind. I just don't slot into that category. If you do, I suggest that you take this stuff out for a test drive, you might really love it. You can get free samples from your local Sephora and I strongly suggest that you go in and swatch and get samples. While Makeup Forever Ultra HD Invisible Cover Foundation is available in a wide shade range, their undertones are pretty limited. R for pink, Y for yellow. There are no neutral tones so finding a shade match may be a challenge. I had fun trying this foundation and concealer out and I'm happy that I had samples with which to play before I made the what would have been for me huge mistake of purchasing this foundation. Do you use Makeup Forever Ultra HD Invisible Cover Foundation? 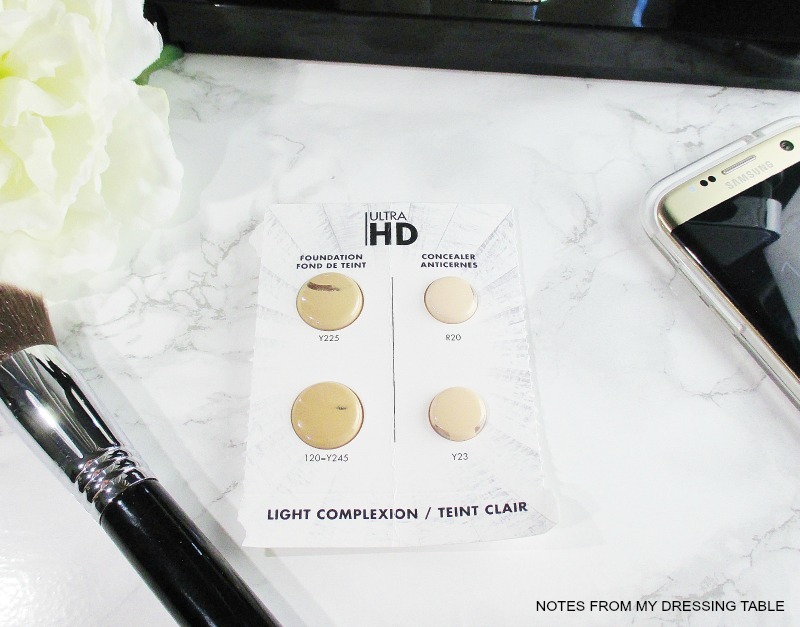 How about the Ultra HD Concealer? What has been your experience with these products? Please do tell. 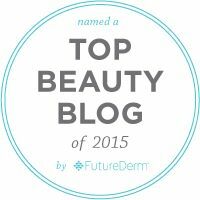 I was offered the opportunity to try the ERASA XEP 30 Extreme Line Lifting and Rejuvenation Concentrate. This new to me product is a unique treatment that temporarily firms the skin and can reduce the appearance of fine lines, wrinkles and smooth and reduce the look of pores and other skin texture issues. Over time, with consistent use, may help to reduce muscle contractions and smooth fine lines or wrinkles and uneven colour and age spots can be diminished. 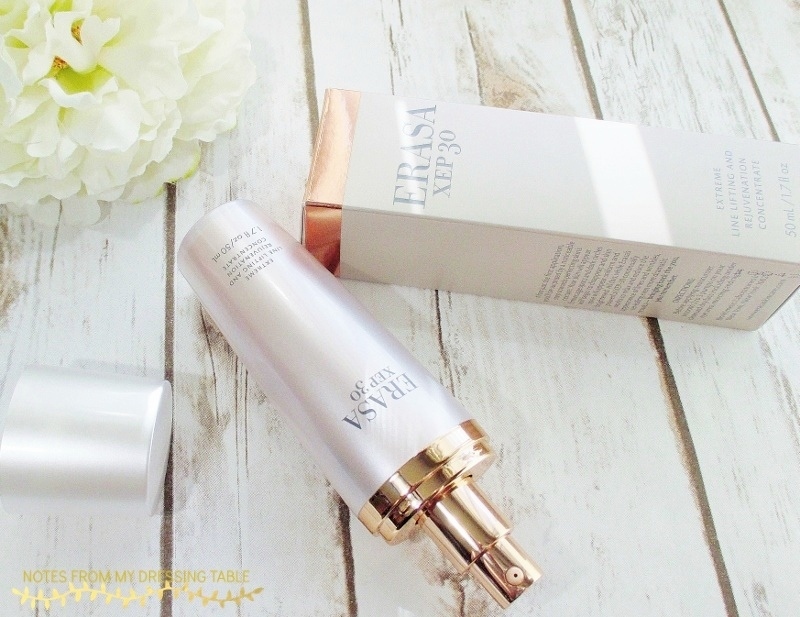 ERASA XEP-30 is an entirely new, luxurious concentrate that introduces the power of the patented neuropeptide XEP-30 for the very first time to the cosmetics market. XEP-30 is a biomimetic, synthetic neuropeptide that relaxes the surface of the skin and may help diminish the appearance of wrinkles -- including deep frown and expression lines. ERASA combines the exclusive XEP-30 peptide technology with two other powerful neuropeptides, creating the ultimate tri-peptide complex. This complex, which is delivered by our patent-pending delivery system, works gently beneath the surface of the skin day-by-day*, it may help to relax muscle contractions and may be smoothing lines and wrinkles. With continued use, wrinkles and lines are smoothed and filled without blocking movement or causing “frozen face” a common side effect of injectables. Notice over time as age spots, uneven skin color and even dark under-eye circles diminish as ERASA helps correct and repair loss of elasticity and dullness improving skin tone and texture leaving you with luminous, rejuvenated younger looking skin. Contained in a sleek, 1.7 ounce pink and rose gold tone bottle with a pump dispenser, the packaging keeps the product within light and air safe. The bottle looks beautiful on my dressing table and feels nice in my hand. 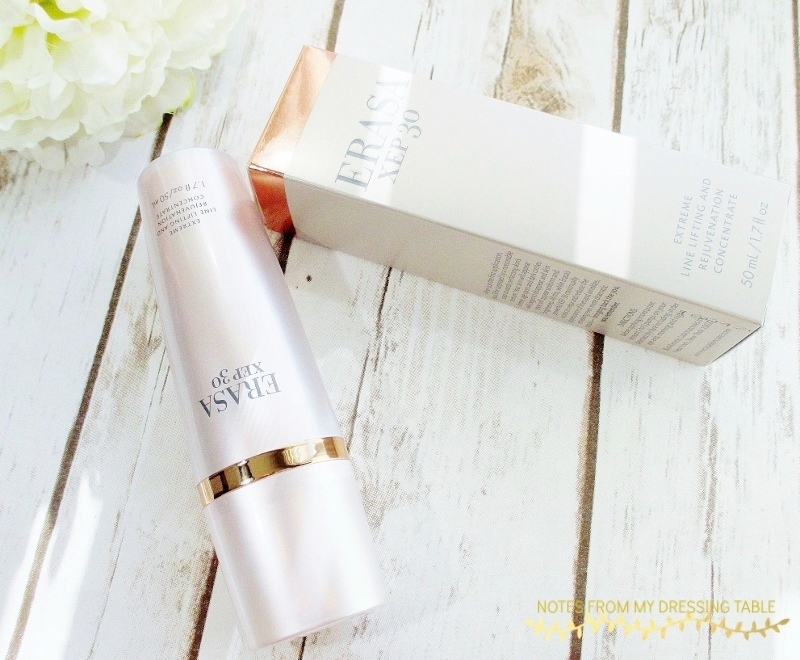 How do I use ERASA? I like to use it during the day, under makeup. I smooth one pump gently over my face, avoiding my immediate eye area and then get a little more to do my throat and neck. Then I follow up with my regular moisturizer, eye cream and makeup. I enjoy the firming sensation that this treatment offers and how my skin looks a bit more toned, a bit "lifted" at my cheeks and brow line. I don't have any age spots (yet!) and my skin tone is pretty even so I'm not noticing much difference, there. I tried to use this as directed morning and evening but it's a bit much for my very dry skin to wear, all day and night, every day. 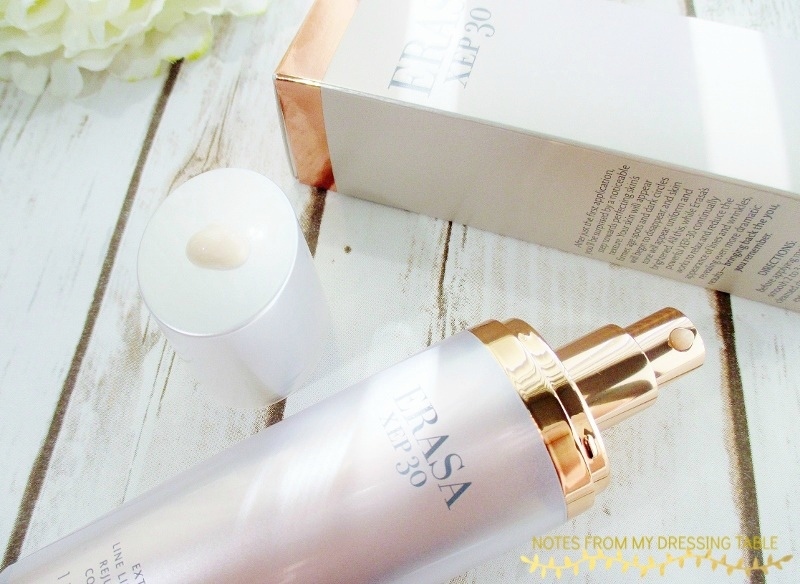 ERASA XEP30 Extreme Line Lifting and Rejuvenation Concentrate works better for me as a part of my makeup routine. I do think that if you have less dry skin, you may really like what this product can do for your complexion! ERASA XEP30 Extreme Line Lifting and Rejuvenation Concentrate is $160.00 for a 1.7 oz. bottle that should last 8 - 10 weeks if used as directed. You can purchase from the website and from Amazon. Foundation is, by far my biggest beauty challenge. 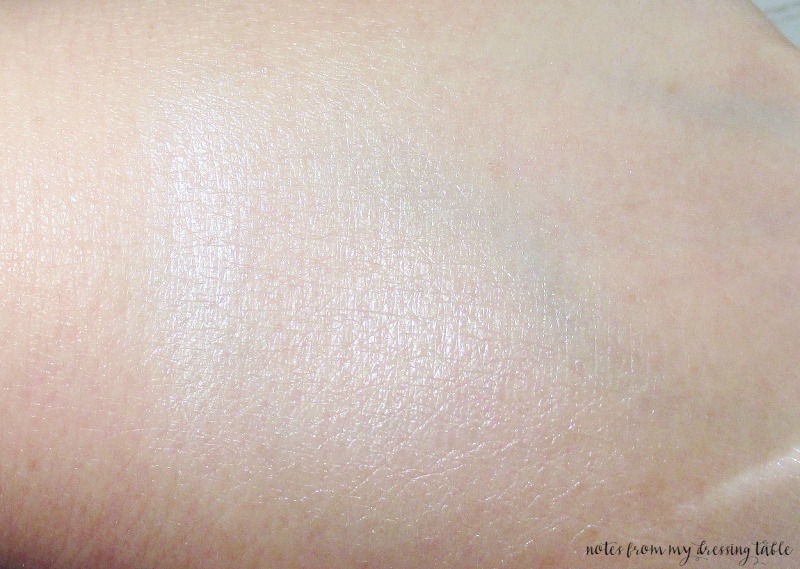 Finding just the right match to my fair, not porcelain neutral skin tone, a formula that is hydrating to my very dry skin yet doesn't feel wet or sticky, that gives me my perfect, desired coverage but won't settle or cake into my fine lines and wrinkles. I love a foundation that feels exquisitely weightless on and it must be absolutely free of any trace of chemical sunscreen. Finding a foundation that meets all of those requirements is a challenge. Hourglass Cosmetics said, "Challenge accepted!" And did they ever pull through for me. 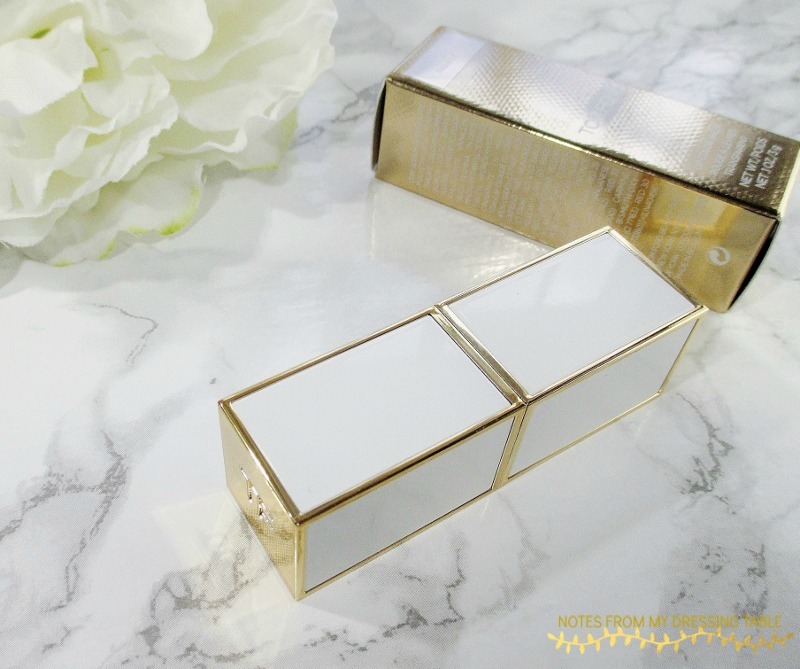 The new Hourglass Vanish Seamless Finish Foundation Stick is an exquisite addition to my makeup routine. Packaged in Hourglass' signature glossy brown and gold in a triangular tube is a highly pigmented multitasker that can work as both foundation and concealer in one. This unique poured liquid formula sick contains double the amount of pigment found in most foundations to offer flawless, up to full coverage in one effortless application. I was sent the shade Blanc. 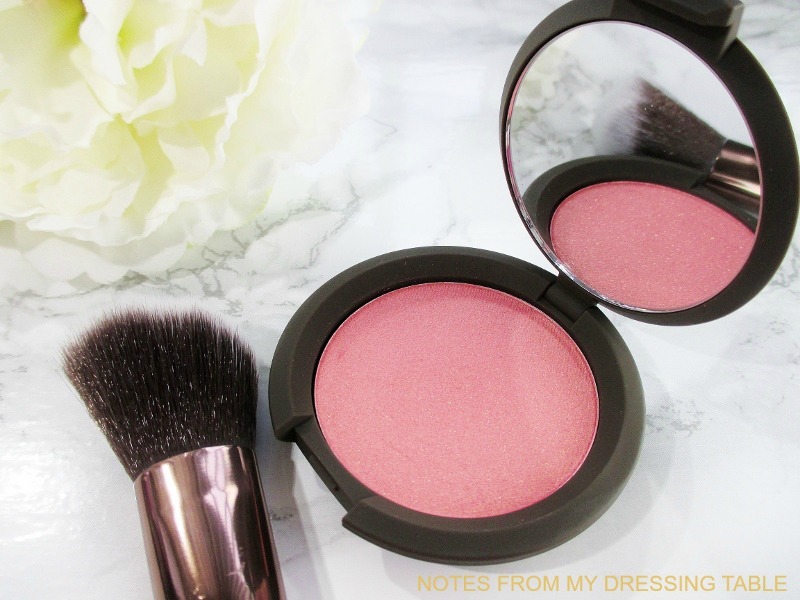 It is just a little bit light and a touch cool for me, on it's own but once I set it with my Hourglass Ambient Lighting Powder in a combination of Dim and Diffused Light, it matches me quite well. I think that to get a more perfect match, I need to pick up Porcelain. 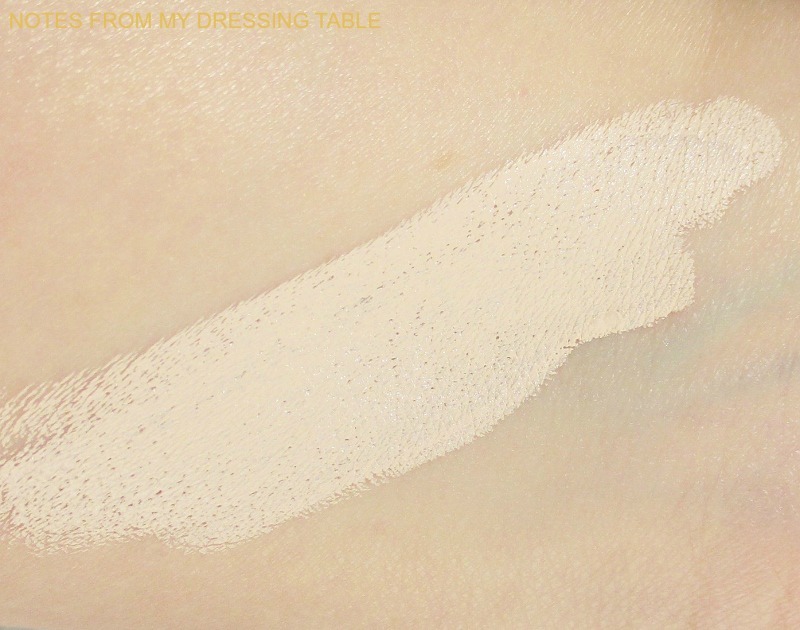 Then I could use Blanc for subtle highlighting. Yes... That is what I need to do. Swatched, you can see how pale this foundation is. 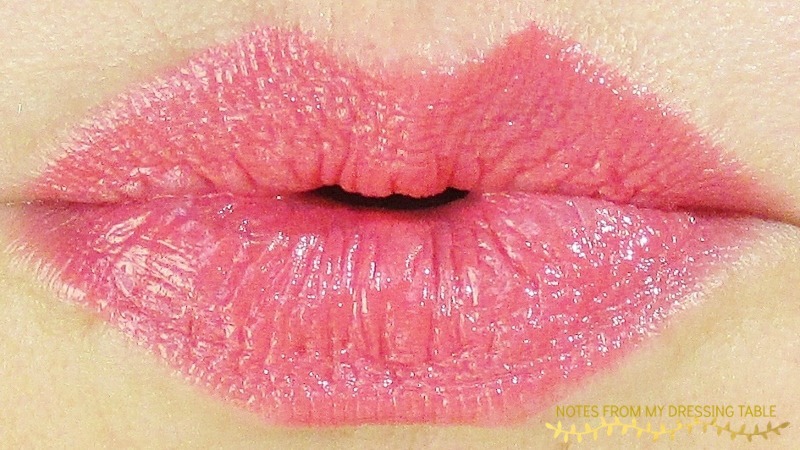 I hope that you can also see just how creamy soft and pigmented it is. Gentle reader, if you are very, very fair and have trouble finding a gorgeous foundation that matches you, Hourglass Vanish Seamless Foundation Stick in Blanc may be your jam. Application of this foundation couldn't be easier. After cleansing and skin care, I smooth on Embryolisse Lait Creme Concentre for a little additional moisture and to prime then touch the stick to my skin and do a few quick, light swipes. 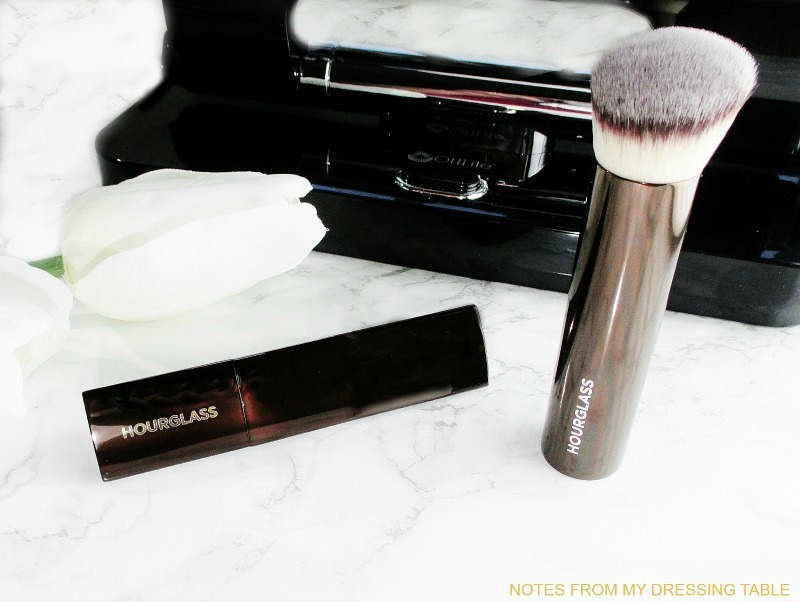 The makeup begins to melt on contact with warm skin and using the Hourglass Vanish Foundation Brush, I can quickly and easily blend the foundation into my skin. That brush is a beautiful tool. The glossy brown handle is long enough to be comfortable to hold and short enough to be perfectly packable. The synthetic bristles are soft as a bunny and densely packed and formed into a soft angle to deliver an absolutely seamless, silken smooth finish. What I love about the Hourglass Vanish Seamless Finish Stick Foundation is that I can sheer it out on areas of my face that don't need much coverage and to avoid settling into my fine lines and wrinkles then add a tiny bit more and buff it in to areas that need a little more perfecting. 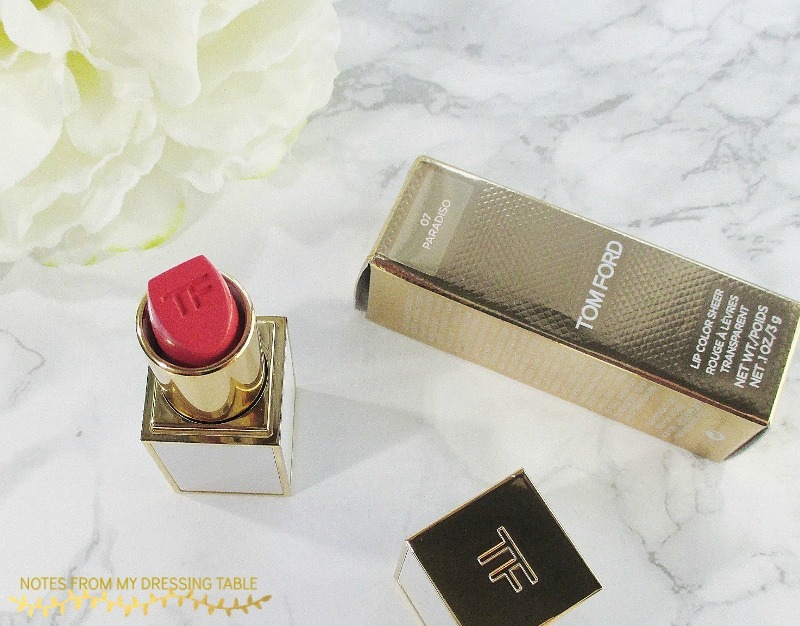 This foundation covers redness very well and takes care of any uneven skin tone like a boss. The feel on is absolutely weightless, I literally can not feel this on my skin! Sadly, it does naught for my dark circles. I had a tiny bit of hope. Nope. I get all day wear from this foundation. It hangs together so beautifully and my complexion looks as good when I am ready to take it off, as it did when I applied it. My one tiny complaint about this foundation is that, while it is gorgeous for dry skin, it will catch on and enhance any dry patches. I have to be sure that my skin is very well exfoliated and nicely moisturized before I apply this foundation. I'm going to be frank, here. I don't think that this foundation is made for oily skin. 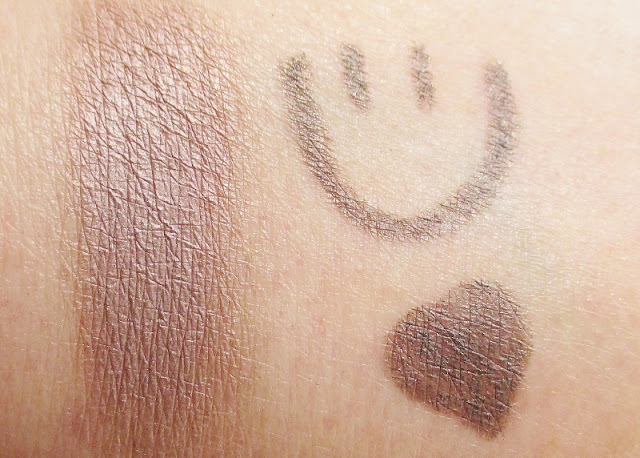 I know that in my oily days, there is no way I could have used and loved this foundation. My feelings aren't hurt. We dry skinned creatures need more gorgeous foundation options. My face draped in this beautiful foundation. Yes... I went way overboard correcting my dark circles in editing. I had to... Those nasty jerks were out. of control. and I hated the look of this pic with no other makeup so I "applied" some in editing. Heh! Heh! 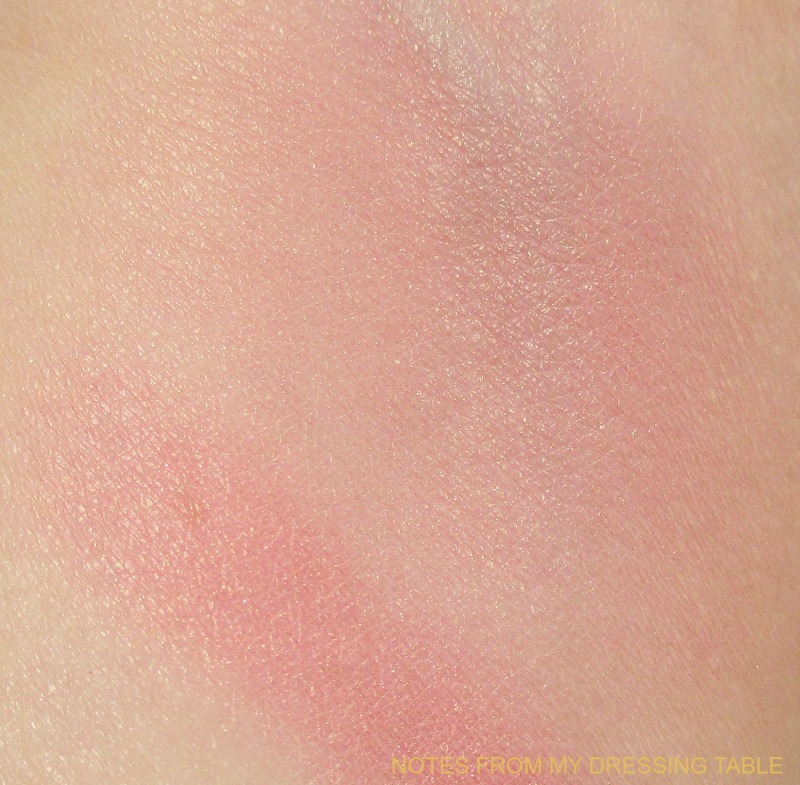 The rest of my skin, tho is wearing only the foundation and a little powder and a hint of blush. I did no photo editing on the rest of my complexion. I am not wearing any additional concealer. My skin doesn't look absolutely flawless in macro but at a casual distance, it's, well, kinda perfect. My husband, who rarely comments on my makeup did a double take and told me that my skin looked amazing. High praise, indeed from Mr. Reticent. 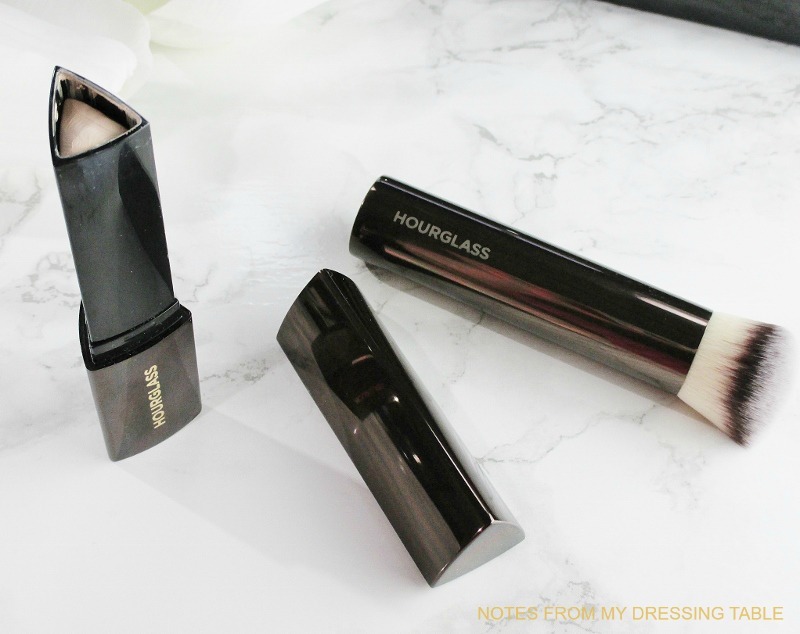 What all of this babble breaks down to is, Hourglass Vanish Seamless Finish Stick Foundation is pretty much my dream foundation for my dry skin and the Hourglass Vanish Foundation Brush is the perfect tool with which to apply it. At $46.00 for .25 oz. this foundation is not inexpensive but I use so little of it, it is going to last me quite a while. The brush is also $46.00 and in my opinion, it is worth the asking price. I am going to enjoy this brush for a long time to come. 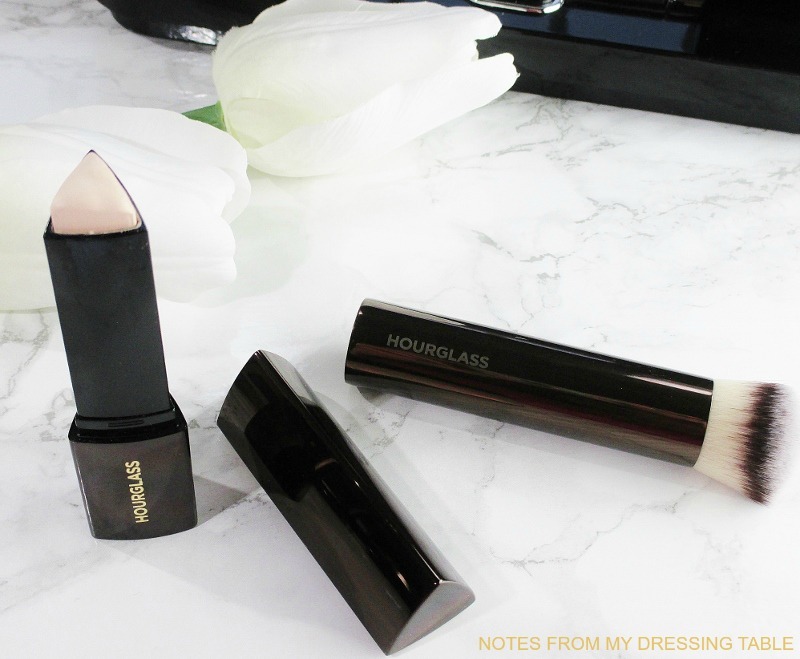 Are you interested in trying the Hourglass Vanish Seamless Finish Stick Foundation for yourself? Pick it up from Sephora and Nordstrom. Grab the brush here and here. Hourglass Vanish Seamless Finish Stick Foundation is free of Parabens, Sulfates and Phthalates and is Cruelty Free. 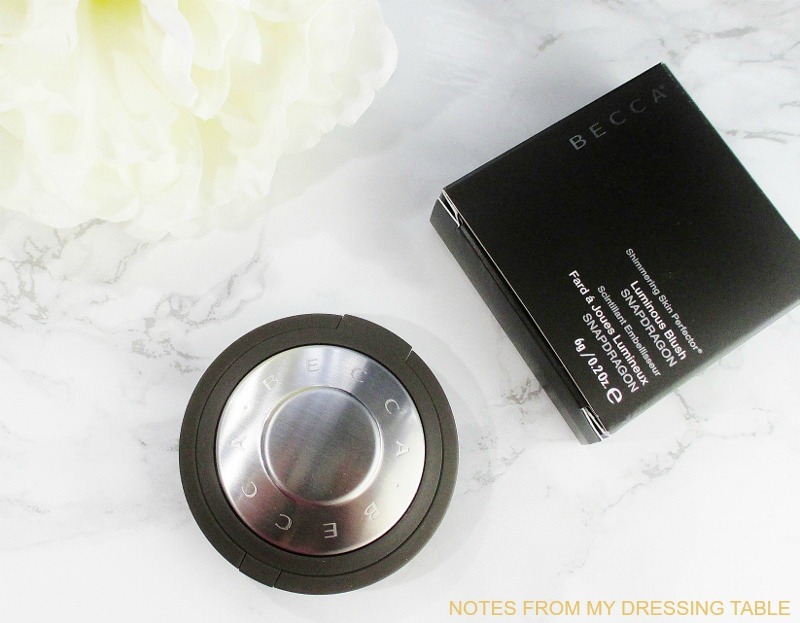 Are you using this exceptional foundation and/or the brush? Please tell me what you think. I'm interested in the experiences of users of different ages and skin types. Soft and glowing skin is almost a requirement in the Summer and one of the best ways to get it is to use a beautiful body oil. Farmhouse Fresh Citrus Cilantro Body Oil is my current favorite way to get that beautiful, soft, glowing skin I crave. Packaged in a heavy, sleek glass bottle with a pump dispenser is a body oil rich in Olive Fruit, Grapeseed, Jojoba, Apricot Seed and Sunflower Seed oils enhanced with Orange Peel and skin loving Vitamins that deeply soften and comfort my very dry skin. This body oil smooths easily across and drops right into my skin, leaving it feeling so very velvety soft without any greasy, slick or slimy after feel. I love to use this body oil right after a shower, when my skin is still damp and steamy. After my shower, I push the excess water from my skin then nip into my bedroom, grab my bottle of Farmhouse Fresh Citrus Cilantro Body Oil and smooth this oil all over, sealing in the moisture from my shower. Okay, why not use this in my bathroom? Well... A klutz, a heavy glass bottle, wet and oily hands and hard bathroom surfaces are not a good combination. I am not about having this beautiful bottle slip from my grasp and land in a mess of shattered glass and oil all around my bare feet. At least if I drop it in my bedroom, it lands harmlessly on soft broadloom. Let's talk scent. Farmhouse Fresh Citrus Cilantro Body Oil has a light, fresh, green/herbal scent that softly fragrances my skin and delights my senses. I like the scent but I don't find that it lasts over long on me. This scent works well with my lotions and perfumes, as I tend to wear light, fresh, floral fragrances, especially in the Summertime. 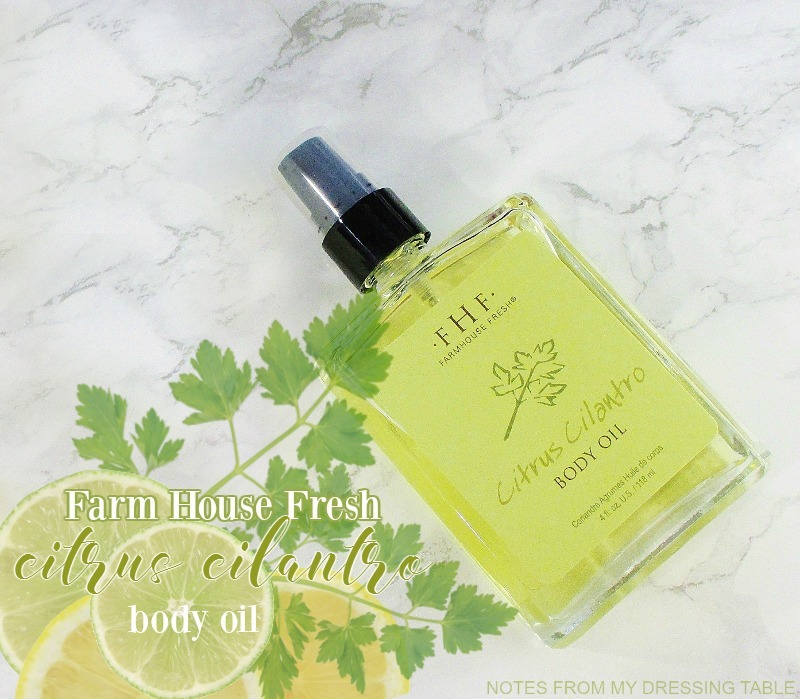 Farmhouse Fresh Citrus Cilantro Body Oil is an affordable, gorgeous treat that will give you soft, delicately scented, glowing skin all the rest of the Summer long and well into Autumn, too. Farmhouse Fresh Citrus Cilantro Body Oil is 96% Natural, Vegan, Gluten Free and of course, Farmhouse Fresh products are Cruelty Free. Have you tried this beautiful body oil or any other lovely Farm House Fresh products? What do you think of it? What are your favorites from this wonderful line? Please, do tell. Hello and welcome to Fashion Flash for the week of August 8th. It is my great pleasure to be hosting our amazing group, this week. Please settle in, hop blog to blog to read some of the best of lifestyle, health and wellness, fashion and beauty for all fabulous people of a certain age. 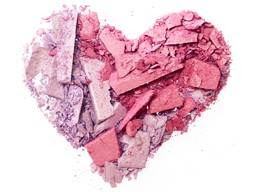 From Prime Beauty; Tarte and Grav3yard Girl have teamed up to bring you the Swamp Girl Eye and Cheek Palette. See if you'd like to take a trip to this swamp! Gearing up for a midsummer trip? Jackie Silver from AgingBackwards.com has a traveler's guide for healthy eating on the road. 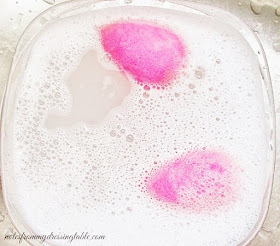 Deb of No Nonsense Beauty Blog shares her favorite facial. Barbara Hannah Grufferman, author of The Best of Everything After 50 and AARP contributer has a few secrets to keep hair looking full and fabulous... even when it starts to get a bit thin. Inka of Glamour Granny Travels tests fabulous travel clothes from Miami based designer ANATOMIE. What is wellness, anyway? Mirabai Holland from Moving Free Certified Health Coach and Exercise Physiologist gives you the answer. Blue and white linen. A Cool Colour Combination for a Summer's Day. Society Wellness shares a delicious pasta recipe that will inspire you to use that beautiful and abundant summer squash. Beauty Info Zone has a waterproof travel kit organizer that is probably what you've been looking for and didn't know how to find. Now you will and you'll love the price. Sometimes stepping back and looking at your current career from a different perspective can lead to your second career. That's what happened to Francine Kaufman. Here's how. 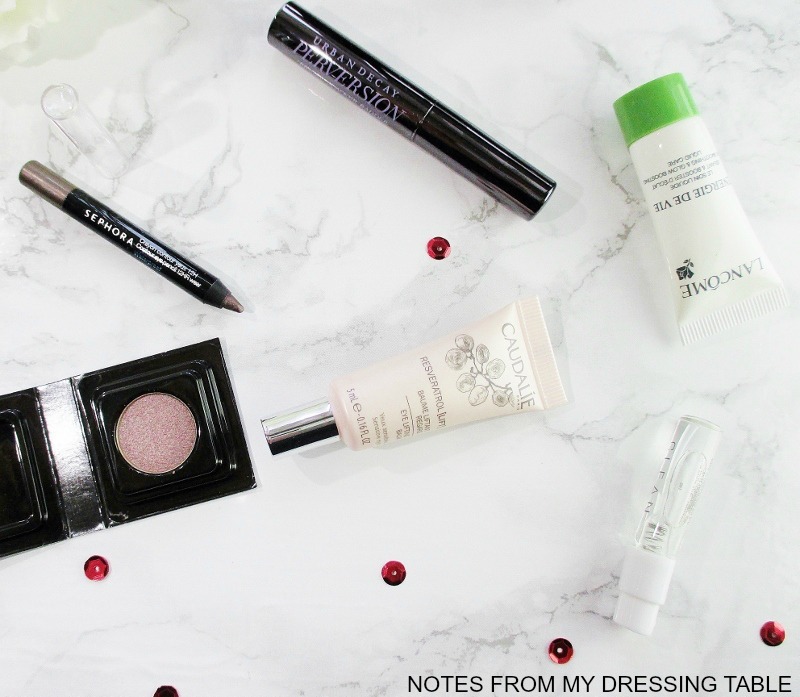 Are you in to beauty subscriptions? Think that one might be fun? I am currently subscribed to one; the Play! 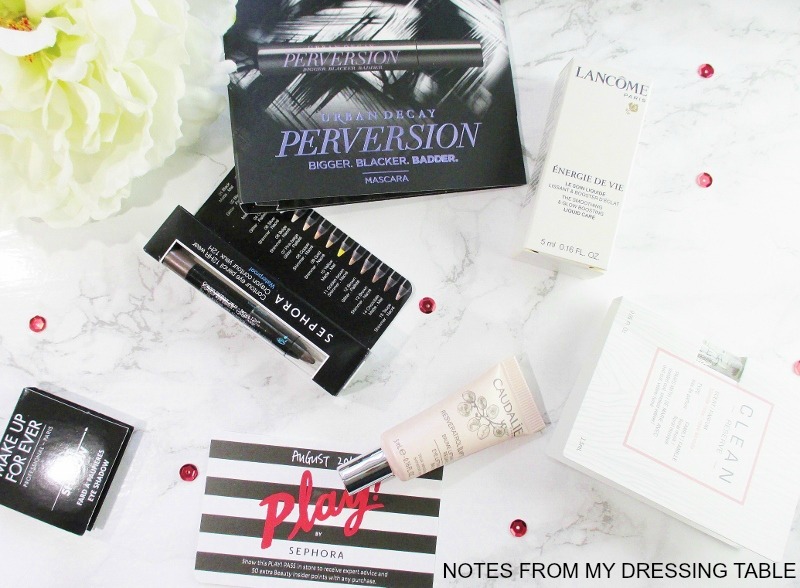 By Sephora Monthly Beauty Subscription Box. In my post I dish the details. I hope that you enjoyed this week's Fashion Flash. Thank you so much for joining us and don't forget to swing by next week.